So following on from Ali's walking video, Here is my 10 months of travel condensed into a few minutes. We recorded little moments of walking, trekking or hiking (they're all the same thing right?) from across the globe that took us all across these countries: Slovenia, Slovakia, Russia, Mongolia, China, Laos, Thailand, Myanmar, Sri Lanka, Nepal, Jordan, Armenia and Georgia. Here is 10 months of travel condensed into just a few minutes. We recorded little moments of walking, trekking or hiking (they're all the same thing right?) from across the globe that took us to the following countries: Slovenia, Slovakia, Russia, Mongolia, China, Laos, Thailand, Myanmar, Sri Lanka, Nepal, Jordan, Armenia and Georgia. ... you are a beautiful, relaxing and mystical place. It’s seriously civilised too making it the perfect place to adjust to middle eastern living. Although, we were very surprised just how costly our Jordan trip would become, we rarely do any detailed research before arriving in a new country. In the case of Jordan, researching beforehand would have been useful. It’s a vibrant country to visit, but one aimed firmly at the medium to high end visitor, not the scruffy £30-a-day travellers that we are. As such, it has been a bit of an adventure trying to get deals, get around and visit the countries top attractions. Arriving in Madaba, about 40 minutes south of Amman, we were struck by just how expensive the local attractions were. To drive up to Mount Nebo and the Dead Sea and back would cost £/JD 40 (£/JD 10 more than our daily budget! ), to walk the aqua water trek of Wadi Mujib was £/JD 26 just to get in, not including transport. Most of the accessible parts of the Dead Sea are run by private hotels, which had rooms starting at £/JD 400 a night! We were worried, how would we get to these places on our tiny budget? 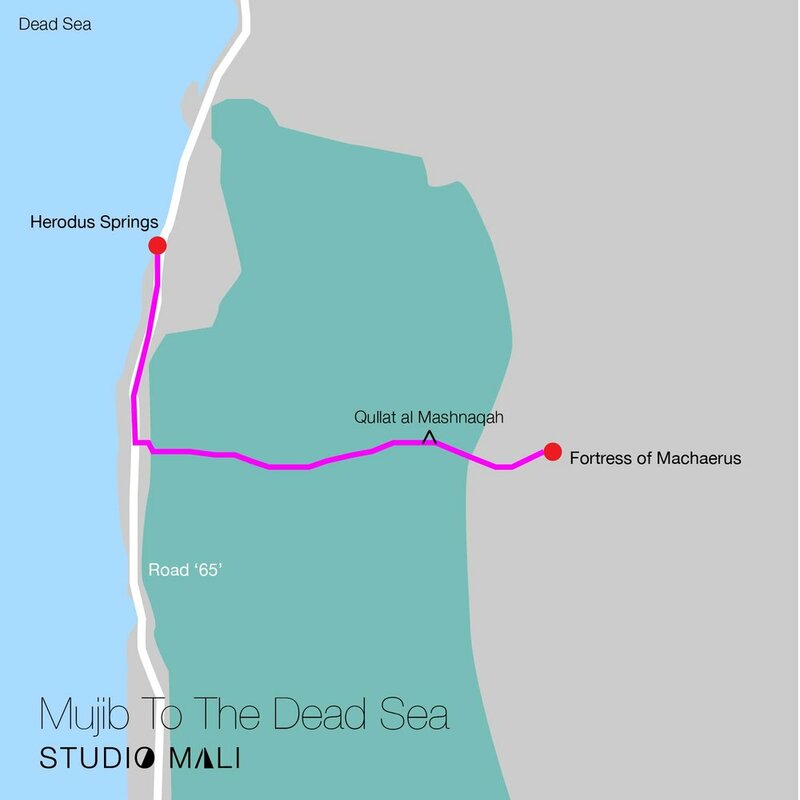 Well, we researched into a lesser known trekking route that passes through the Mujib Nature Reserve and finishes at the Dead Sea! Sounds like the perfect day to us; trekking, adventure and stunning scenery. I can tell you now... we did it, it’s possible, we trekked through the nature reserve and swam in the Dead Sea as the sun set, it was an incredible day and cost only £/JD 12 but only with a bit of luck. It’s worth noting this is quite an adventurous route and requires some trekking experience, as well as being well-prepared and some common sense. You’ll be walking across Jordan’s rugged desert terrain with no guidance, roasted by the midday sun with only the continuous view of the ever enlarging Dead Sea as your guide. Be aware that you could be walking anywhere between 4 and 6 hours so you should be quite fit and happy to walk in the sun all day. You’ll need to run out and grab some supplies before you leave, all our supplies and water cost just £/JD 3.50. We use water purifying tabs to clean the local water, it’s cheaper and reduces our use of plastic. Ensure Jordan has been downloaded. Mark the following points ‘Mukawir’ ‘memorial for John the Baptist’ and ‘Herodus Spring’ (coordinates: 31°35′50.1″N 35°33′34.86″E). Food - Jordanian bakeries are perfect for cheap goods, we bought flat breads and sweet foods. We picked up hummus, crisps and fruit from a local shop. Sun cream - high SPF, we had 50. This trek is best started from the busy city of Madaba, and 27km south of there at the top of a mountain is a village called Mukawir. The day rate for a taxi is £/JD 40 but you can avoid paying that much by getting a one way Uber to Mukawir for around £/ JD 8. The Fortress of Machaerus is a local attraction and it’s also the treks starting point, luckily Uber will automatically set this as the destination as the site itself is quite popular. The journey takes around 30 - 40 mins. We arrived just after 9am. The fortress is worth visiting before you start the trek, especially if you have an interest in biblical references. It was a battlement used for spotting invasions and may have been the place where John the Baptist was beheaded! Duelling factions eventually destroyed the fortress, whose crumbling remains are still visible now. To visit the fortress you’ll need to walk up pathed route to the top. To start the trek you’ll need to walk back to the bottom again but you should look out for well trodden animal path in the rocky terrain. Follow the path with you eyes first, it should lead to the next mountain (named Qullat al Mashnaqah) due west from Machaerus. If you can see a path tracing the mountain to the west jump over the wall and follow the path to the top of the mountain. Here is some general advice for following the route. There are several routes used by farmers, their herds and also roaming goats. The goat tracks are tight and generally trace higher terrain, which are more treacherous and best avoided. For the most part, the route is an easy walk and is well trodden. We followed a goat track following a locals advice and it quickly became slippery, steep and dangerous, if you approach similar terrain you are on the wrong path and should turn back. It’s worth noting that we walked the wrong way down the right-hand side of Qullat al Mashnaqah mountain based on the (incorrect) advice of a local farmer who wanted to help us. He rang a friend to give us directions in English but directed us towards the bottom of the Wadi where there was no actual path. We ended up wasting 1.5 hours following his advice and basically rock climbing a dangerous goats path. So, getting advice from locals might not be that useful. I’m sure these guys walk these paths everyday but they’re too dangerous for trekkers who aren’t experienced climbers. You can easily avoid this by simply climbing up over the top of mountain, the trail is pretty easy to spot. Once you’ve reached the top of the mountain the journey down is actually quite easy as you’ll have two paths to choose from. One is a walking route that contours the edge of the peaks, the other is a wide dirt path set back from the edge. We took the wide dirt road path because you can’t get lost on a road, right? You actually can’t, the route down is very easy but just watch out for loose stones and your ankles. Another benefit, you won’t meet any cars on this dirt road and it’ll take you through some incredible terrain. We stopped at many points to take in the rugged scenery and enjoy a picnic. You’ll also be walking ever closer to the Dead Sea and this a perfect gauge to work out how long you’ll have left. Our entire walk took 6 hours but 1.5 hours was added due to the wrong path at the start. When the dirt road finally joins a tarmac road you’ll be close to the sea but you’ll need to navigate down some springs to join the main road, this is where the common sense comes into play. It’s not far so we’re sure you’ll find a route down, we found a well trodden route close to where locals were bathing in some springs by looking for heavy footprints in the ground. Frustratingly, much of the Dead Sea in inaccessible due to government fencing, we guessed this is part of their border controls from Israel. You’ll need to walk down the hill to reach road ‘65’ and then north to Herodus Spring. We won’t lie, walking alongside a busy road for 3km is not the best. Some armed guards at an army checkpoint were especially interested in how we got to the road without a car, few people do this walk it seems. Continue walking until you spot big holes cut into the fences and then further on a whole section of the fence has been removed so cars can park near the springs and the Dead Sea. We were so happy to see local families down by the sea enjoying the beach. This spot was definitely a locals place to bathe but it was also pretty secluded and barely busy with no more than 3 families visible from the shore. Floating in the Dead Sea after 6 hours of trekking was the perfect end to the day. Don’t forget to rub some enriching salty mud into your skin for the perfect spa treatment, never has my skin felt smoother! I’m sure you’ve been wondering how we got back to Madaba for free. Well, we were ready to pay for either a yellow private taxi, a white shared taxi or a local mini bus. But before we could hail any of those, a kind Jordian man named Musa and his friend Hasan stopped and offered us a journey, we offered him money but he didn’t want any because he was heading to Madaba anyway. This encounter turned our amazing day into an unforgettable one. Musa kindly offered us tea at his house and we had the privilege of meeting his son too. After two cups of sweet Jordian tea, some laughs and an amazing sunset across their veranda. Later, Hasan drove us back to our hotel in Madaba. What a day. One of our favourite from our entire 9 months on the road. We finished off our cheap day by eating in the local kitchen of Abu Yousef found on the back street behind the famous Haret Jdoudna restaurant. Our meal was just £2/JD for hummus, meat and tomato, huge breads, pickle dip and fresh onion chilli and tomato. Fresh, tasty and cheap. Our day at the Dead Sea was so memorable, trekking unmarked routes through a national park, floating in the salty water and our ad hoc journey home with friendly Jordanians. The perfect low cost day out in the Middle East. We hope you found our post helpful? If you have questions, suggestions or thoughts. Please add your comment in the box at the bottom of post. Thank you for reading. After 3 weeks of continuous walking, where we covered more than 200km, with half of it at high altitude was not without it's challenges! Ali had an awful stomach bug for the first 7 days and I had my first taste of altitude sickness but we overcame these troubles to reach the highest lake in the world and walk the longest pass in the world, reaching an air thinning height of 5416 metres above sea! For all it's aches and pains walking the Annapurna circuit has been one of the best things i've ever done. The landscapes are beautiful and change every day, we met loads of great people and the local Nepali are such welcoming hosts. What's more, two people can live in the Himalayas for just £20 a day! I'd swap that for London any-day... We just need to save some cash to come back now! If you love the outdoors and haven't heard of the Annapurna circuit this video will give you a little taste of what it's all about.